This model was initially developed as a prototype for a two- or three-seater high-speed cutter combining the qualities of a surface-effect vehicle (type “A”) and an air-cushion craft with the front position of the only windmill. Its full name is: amphibian air-cushioned vehicle with applying of surface-effect. The cushion seal is formed of two cylinders (an aft seal), and also there is the front and rear flexible seal. At low speeds it moves as a usual air-cushioned vehicle, but gathering the speed it starts to work in surface-effect mode, and at that the front seal is automatically pressed out by the counter-current airflow. The circle seal design reduces the power requirement compared with end washer or hull designs. Additionally, the front location of the tractor propeller simplifies the mechanics as no bulky transmissions are needed. The cutter bares some resemblance to the Sever-4 by Sokol from Nizhny Novgorod, but it has a number of distinctions that give it unique properties differentiating it from the Sever. It's hard to call Sever-4 a real surface-effect vehicle since it has no aerodynamics, platform profiling (see the photo). Probably "a surface" gave it some unloading, but it was only a few per cent. In addition to it, it had a complicated motor system: driving gears for two coaxial propellers. But in general Sever was the sample of the rational capacity utilization. 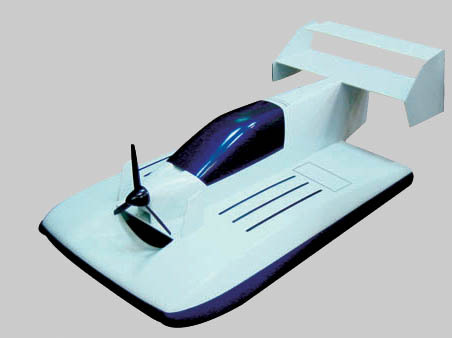 Compare: Sever-4 is powered by 20hp/passenger Aquaglide-5 is powered by 65.2 hp/passenger Even taking into consideration the higher speed of Aquaglide the same the gap between power inputs is absolutely incomparable! So much for the notion that surface effect is more efficient! Reworked aerodymanic enable the Cutter to safely reach higher speeds that the Sever. A simple device is used to improve sensitivity and give the Cutter much tighter turning radius that any other air-cushion craft or surface-effect vehicle. Based on results from the cutter experimentation, I am designing a ful sized 5 seat craft. The craft will out perform existing surface effect craft, and will do so with increased safety. Patten Pending: Preliminary examination has received a positive response.